The Wall Nanny is now available in the color black. The Wall Nanny is a wall protector for indoor pressure mounted gates. It also helps stabilize the gate so it doesn't fall down and hurt a child or pet. Dallas, USA - January 2, 2019 /MarketersMedia/ — TMW Family Company has now released a black Wall Nanny. The new color will go nicely with black safety gates for babies and pets. The black color will add to other colors such as white, brown, and gray. The variety of colors helps keep the Wall Nanny from being obtrusive and allows them to blend in with different gates and baseboards/trim. What is a Wall Nanny? The Wall Nanny is a baby gate wall protector. Its soft rubber backing will eliminate the damage caused by pressure mounted spindles on baby gates. Thus, you won't have to paint or replace wall paper once you remove the gate. The Wall Nanny also helps stabilize the gate so it doesn't slip, slide, and fall down; thus injuring a child or pet. The Wall Nanny is compatible with all gates that are "pressure-mounted" or use pressure mount spindles. Tightening the spindles or screws down onto the Wall Nanny will help stabilize the gate to the wall and traction it so it doesn't move around and scuff up the walls. 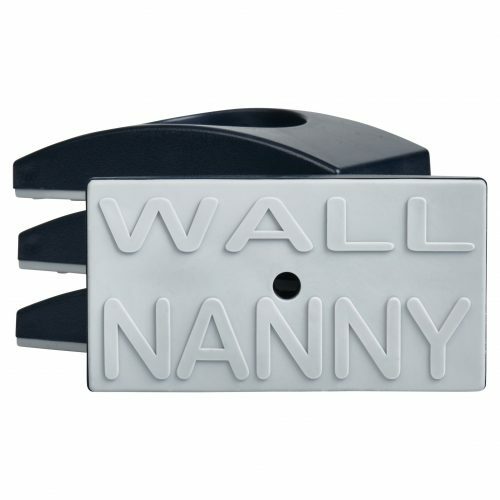 Wall Nanny's are available in two different sizes: regular and "mini" size. The Wall Nanny Mini is small enough that it will fit in almost all areas that a pressure mounted baby gate will go. They will also fit in doorways and places where small trim is. Both sizes of Wall Nanny's come in white, black, brown, and gray colors. The Wall Nanny is manufactured in the USA. TMW Family Company loves creating jobs for American workers and takes pride in the high quality products that they create. For more information on Wall Nanny and Wall Nanny Mini products you can click here. To watch how to use the Wall Nanny please watch this video. For inquires about Wall Nanny products please visit www.wallnanny.com.